Celebrate at your next Thanksgiving or Christmas party with a cocktail for the season. These Salted Caramel Apple Martinis taste like fresh picked apples dipped in caramel. Delicious! This salted caramel apple martini is like biting into a caramel apple. A slightly sweet apple martini enhanced with a caramel rim and apple cider. After making my salted caramel sauce, I’ve been trying to find any and all recipes that I can incorporate this delicious sauce in. So, you should have known that I wouldn’t leave a holiday cocktail with caramel out of the mix! This drink is really more of a fall cocktail recipe. It’s the time when you’ll start to see apple cider making its way onto the shelves. A time where people go picking apples in orchards. But since apple cider tends to linger on the shelves through Christmas, I felt it was the perfect martini recipe to add to our 25 drinks of Christmas! This cocktail is super easy to concoct. Fresh apple cider and caramel flavored vodka make up this fabulous holiday drink. If you don’t have an apple orchard in your area, most grocery stores carry freshly pressed apple cider in their produce department. A quick trip to the liquor or grocery store (depending on where you live) and you’ll find many different brands of caramel flavored vodka to choose from. Be sure to chill your martini glass with ice water before drizzling salted caramel topping on the inside and the rim of your glass. 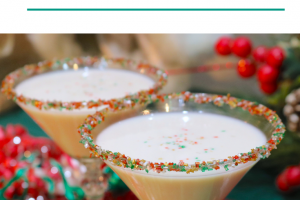 A fun holiday drink composed of apple cider and caramel vodka. The perfect combination for a festive holiday cocktail. For the caramel rim, pour caramel sauce on a plate and coat the rim of a martini glass by dipping it in the caramel. Combine all ingredients in a cocktail shaker filled with ice. Shake vigorously for 10 seconds and strain into the martini glass. Garnish with a thin apple slice. 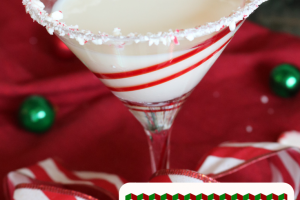 If you are just tuning in for 25 drinks of Christmas, don’t forget to check out all the other Christmas party drinks including other Christmas martinis! 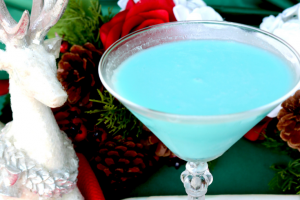 This is Day 6 of holiday cocktails so you have plenty left to enjoy!